On May 2, 1972, the magazine La Domenica del Corriere (basically the Italian equivalent of Parade) published a picture of Jesus Christ (above, left). This wouldn’t be a big deal, except the picture was supposedly a photo. And it had been taken by a living monk, Benedictine scholar Pellegrino Ernetti of Venice. Various sources have referred to him as a musicologist, an exorcist, a quantum physicist, or a total nutbar. While he did perform exorcisms and did study archaic music, his degree in theoretical physics is very much in doubt. No one seems to know where he earned it. According to friend and paranormal enthusiast Francois Brune, Ernetti explained that in the 1950s, Werner Von Braun, Enrico Fermi, and ten other internationally renowned scientists agreed to help him develop a time machine. In the course of his studies into Gregorian chants, Ernetti had stumbled upon a kind of time travel involving communication with the dead (EVP). While using a recorder to study the harmonics in these chants, he and Father Agostino Gemelli heard the voice of Gemelli’s late father speaking to them. This convinced Ernetti that electromagnetic energy from the past could be accessed, with the proper equipment, enabling us to view or even hear things that happened on earth years ago. A similar “recording” theory has often been put forward as an explanation for ghosts, phantom ships, spectral cities, and other ephemera. The time machine Father Ernetti came up with couldn’t physically convey anyone to another time, though. Instead, it captured images from a given time and place. Ernetti called it the Chronovisor. Ernetti and the scientists witnessed numerous historical events through his time camera, but of course the one that interested Ernetti most was the Crucifixion. The only photo he provided to the public actually showed Christ dying on the cross, his eyes rolled toward heaven. After their forays, the team agreed to dismantle the Chronovisor and secrete its components in various parts of the world, for fear it would fall into the wrong hands. Ernetti couldn’t, or wouldn’t, provide Brune with any evidence to back up his story. While it’s true that Father Gemelli reported hearing his late father’s voice on a recording in the ’50s, it isn’t known if Ernetti actually worked alongside him. There were allegations that Ernetti confessed to hoaxing the photo and the play on his deathbed (without retracting his claims about the time machine), but in 2003 (9 years after his death), Francois Brune insisted Ernetti had been coerced into confessing, that the Chronovisor was real, and that the Vatican probably tried to gain control of the device. An only slightly less credulous stance is taken by Peter Krassa in his book Father Ernetti’s Chronovisor, which is the primary source for this post. Brune and Krassa were a little too late to convince the world that Ernetti pioneered time travel. 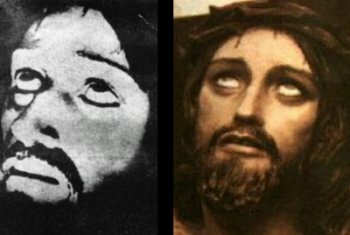 Almost as soon as the Jesus photo was published in 1972, people noticed its uncanny resemblance to a carving by Cullot Valera (above, right), which hangs in the Sanctuary of Merciful Love in Collevalenza. Brone dismissed the resemblance, suggesting that a nun may have directed Valera whilst in the throes of an ecstatic vision of the Crucifixion. Sure thing. Pious hoaxes, even ones this absurd, are not unheard-of. In 1987, a Kenyan nun called Sister Anna Ali declared that Jesus paid visits to her room. Zambian archbishop Emmanuel Milingo requested evidence, so she supplied a “photo” that was plainly a drawing. This was enough to convince Milingo (later defrocked for performing unauthorized exorcisms). Father Ernetti refused to tell Brune how his machine was assembled, mentioning only that a plain old cathode ray tube from a ’50s TV set was used in the viewing screen. This renders his and Brune’s claims essentially un-debunkable. So If you really want to believe that some of the finest and most ambitious scientists in the world discovered the secrets to time travel, commissioned a monk with no specialized expertise to develop a time machine, used it to witness a few major historical events without taking more than one photo (that one photo being a grainy head shot), then decided, “Nah, the world’s not ready for this. Let’s go back to making Disney movies“, go right ahead. Billy Meier, the one-armed Swiss contactee we’ll see again in this series, claimed that his buds from the Pleiades helped him move through time and space to tour a “prehistoric planet”. He presented a few extremely blurry photos, including a dramatic one of a pterodactyl dropping a mouthful of food in mid-flight. Compared to his famous UFO photos, they sucked, but his bevy of devotees didn’t seem to care – not even when critics produced an illustration from a 1972 book entitled Life Before Man that perfectly matched the pterodactyl. You can see some of the other dino photos in this video, along with a photo of a dust storm on Mars and one of Billy’s alien girlfriend, Asket (actually a still from The Dean Martin Variety Show). In 1981 Nebraska farmer Steven Gibbs received a letter from himself. His future self. Written (and postmarked) in 1994, it informed him that he would soon be embarking on a struggle to build a time machine, and “predicted” some other events that would soon occur. Gibbs dismissed the letter as a prank until these things actually started to happen. Then he got to work. A mere four years later, he had a fully functional Hyper Dimensional Resonator that can astrally transport you just about anywhere. Like most such inventions it is mysteriously powered by an electromagnet, a Tesla coil, and a quartz crystal, and can be purchased for a few hundred dollars from the same websites that sell stuff like stirwands. I’m pretty sure it’s what Napoleon Dynamite’s brother used. Now for the mindf*** part: After he completed work on the HDR, Gibbs decided not to write a letter to himself in 1994. That’s a wise choice, but how did he invent the thing if (as he claims) it was advice from his future self and another time traveler that made its creation possible in the first place? And which postal service are these people using, anyway? A nearly identical device was created under a railroad bridge in Chalk Farm, London, by Tony Bassett. He originally designed it to boost the immune systems of cancer patients, using a powerful magnet and electrical field to generate a broad range of high-frequency energy. Naturally, people have reported feeling disembodied when they get too close to the “bio-energizer”; its effects are probably similar to those induced by Michael Persinger’s “God helmet“. Bassett believes it helps users direct their consciousness toward any time or place. Then there are those unlucky few who have been forced to travel through time, usually as part of a secret government experiment: the doomed sailors of the USS Eldridge, the Montauk boys, etc. Duncan O’Finioan is one such time traveler. In 1966, when he was six years old, Duncan was inducted into a top secret program called Project Talent, which trained children to become psychic super-soldiers. His first session was conducted in the back room of a Kentucky hardware store. Duncan believes he was selected for his ethnic background (half Irish, half Native American), because this particular genetic mix often results in enhanced psychic abilities. At one point in his training, Duncan was strapped into a chair and sent through a wormhole to another time and place. The children of Talent and its various sub-projects were also trained to kill with the power of their minds, making them an invaluable tool in Vietnam and in political assassinations. Duncan mentally slaughtered many people before deciding to come clean and reveal Project Talent to the world in 2006. He had two compelling items of evidence: a cranial implant and a bionic arm. For some reason, even though he has been interviewed on video by Project Camelot, he hasn’t gotten around to showing us this evidence. As distasteful as O’Finioan’s tasks were, at least they were exciting. The same can’t be said for the job given to John Titor. He was sent back in time to fetch some archaic computer technology for the bigwigs of the future, who are apparently too busy watching Rocky XXII to run their own damn time-travel errands. 2004: Civil war would erupt in the U.S., pitting militias and other armed citizen against something he called the American Federal Empire. 2014: Civil War II ends when Russia attacks the U.S. WWIII begins. The U.S. loses, and is reduced to ruins along with China and the EU. 2036: America is rebuilt and back on its feet, though considerably diminished. Then Mad Cow becomes pandemic, affecting virtually every beef-eater on the planet. Despite all these setbacks, the U.S. is in possession of time travel technology. In fact, time travel would become a reality in 2001, right after CERN’s larger facility began operating. Titor was a U.S. soldier working on a time-travel project based in Florida. His mission: Go to 1975 and retrieve an IBM1500 computer, which could be used to debug legacy computer programs (the UNIX 2038 timeout error). Titor’s granddad had been involved in its development. Like another time travel insider we’ll look at later, Dan Burisch, Titor believed in some kind of parallel timeline or universe. Hence, the past he was in wasn’t actually his own past – just a very similar one. Titor decided to make an unscheduled stop in the year 2000 to save some family photos that he knew would be destroyed in Civil War II. While there, he decided to blow the minds of a few basement dwellers by posting photos of his time machine on the Coast to Coast AM (C2C) online forum and at anomalies.net. It was housed in a ’67 Chevy Corvette, but Titor later moved it to a truck so he could have four-wheel drive. Titor returned to 2036 in the spring of 2001. A website devoted to his wisdom is still up, though, and for a time his attorney and spokesman, Larry Haber, remained a frequent guest on C2C, sharing Titor’s information about all the terrible things that were supposed to happen to us but actually didn’t. Thanks a bunch. This entry was posted in Hoaxes, Hoaxes from Space, Religion, Time Travel and tagged contactees, ESP, hoax, Jesus, photography, science. Bookmark the permalink. Maybe these people are frustrated science fiction writers. If so, the genre gains from their attention being elsewhere. The trouble with fiction is, it is has to be realistic and at least somewhat believable. Big fail for all these guys.